So this is day 5 of the Dec. 5 CD Concert Countdown. Today’s piece has two names. On the CD, it’s called “Stone Mysteries”, composed from recordings I made at the Mnajdra temple in Malta. The piece is also the soundtrack for a video created by my good friend and collaborator Jacky Sawatzky entitled “Soundlines”. This video will be screened at the concert, with part of the vocal soundtrack performed live by myself and singer Penelope Cookson. The three Mnajdra temples are perched on the rugged coastline of Malta’s southern coast overlooking the Mediterranean Sea. These temples date from about approximately 3000 BC, with the most southern temple functioning as a solar calendar. This southern temple has two circular apses, with one in front of the other. Think of a figure 8 and that’s roughly the design structure, with a few extra nooks attached to the sides. When you walk in through the main doorway you are in the first chamber and then enter into the second chamber through another doorway. This doorway plays an important role in the functioning of the solar calendar. At both the spring and fall equinox, the rising sun shines straight through the main entranceway and following a straight line through both chambers, lights up the altar or shelf area at the very back of the second chamber. During the summer solstice, the rising sun enters at an angle and shines on the left side of the doorway between the first and second chambers. On the winter solstice, the same thing happens, only it’s the right side of the same doorway that is lit up. As well, the beam of light is much narrower during the solstices. Check out one of the pictures posted today for a great visual of how it works. Although, this is mechanics of what happens, the real question is, as always, what are the deeper layers of meaning behind the architecture of these incredible buildings. Part of it certainly is that it speaks to the close connection that these temple builders had with the elements, the moon and sun, and with nature. Not to romanticize the past, but living in a balanced relationship with the earth is something that was and is at the heart of ancient and indigenous culture and is what is so lacking in our own. Which brings me to “Soundlines”. Jumping half way around the world from Malta to Vancouver, BC, the footage for Soundlines was taken days after a devastating storm in Stanley Park uprooted and knocked over thousands of trees. If you know Stanley Park, it was an incredible to go there and witness the force of the winds and the massive changes to the environment. There was sadness in the community at the loss of so many beautiful trees, but such is the way of nature. Change, decay, renewal, rebirth. Was the high velocity of the winds a result of human induced climate change?? No one can say for sure, but we are aware of the increasing number of strong storms that are like nature’s way of sending out a wake-up call. A call not only to think about how we generate energy that is sustainable, but also a call back to the ways of knowing how to connect, commune and engage in a relationship with nature and all the forces that are part of the complexity of life. A way that our ancestors knew. When you compare the picture of the southern temple of Malta posted below and the green forests of BC on the Soundlines video (go to http://vimeo.com/15502853) you’ll see a stark contrast of environments. Yet, there is a matching of the two places–Malta and Stanley Park–for they both bring us into a deeper respect for how we consider ourselves as humans in the larger cosmology. 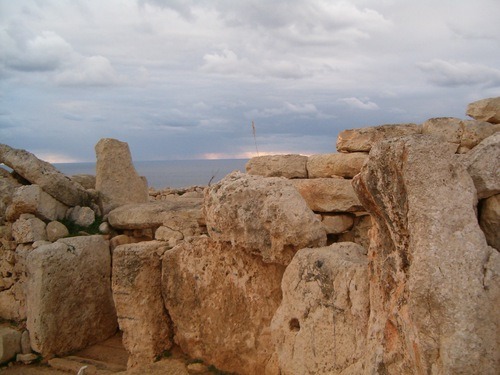 The Mnajdra picture was taken from an angle of the front area of the temple overlooking the sea. The solar calendar doorway is at the bottom left. 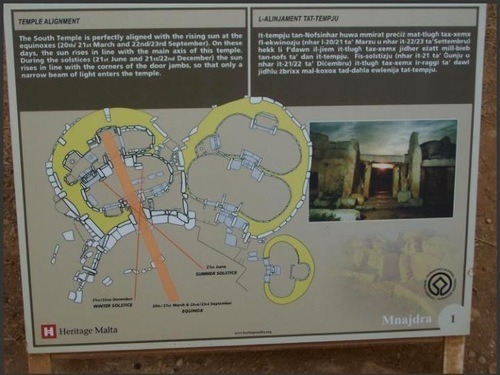 In the second image, you can see an overview of the three temples and how the sunlight works with the architecture.